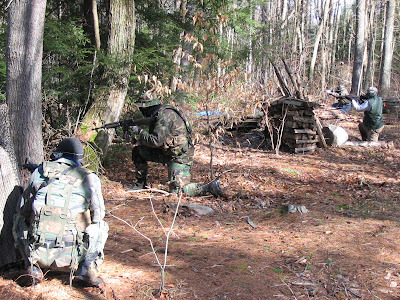 There are some good points and some bad points to using airsoft as a training tool. 1) Rifles have very short range, allowing people to walk around with impunity past distances of 40 to 60 yards, depending on the weapon. Obviously, this leads to a bad feel for the need to keep under cover. This can also develop a willingness to ignore proper movement tactics. 2) Just about anything will stop an airsoft BB, creating an artificial feel of cover when use of such “cover” would result in instant death in the real world. 3) Almost all have full auto, resulting in poor fire control and a very unrealistic view of what is possible in the real world. 4) When you get into the game, you tend to ignore injuries, thereby aggravating them. 1) It is great exercise and very fun. Even people who dislike exercise will enjoy doing it. 2) It easily shows certain weaknesses and observations in field operations which I will go into detail below. 1) If you get into close contact with people who are properly equipped, you are dead. 2) Old people who do PT can keep up with young people short term but will feel the pain after a period of time. 3) Rapid movement is easily spotted. 4) Slow movement with well chosen routes will keep you hidden. Always stay out of the light when moving if possible. 5) THE BIG ONE: Force identification is extremely difficult. We had 3 teams and it was very difficult to tell who was who. 7) Armor (and aviation) will be a big problem. 8) Amateurs tend to bunch up and do not move tactically. 9) Command and control (C&C) at platoon level is difficult, at best. Company level C&C may be possible, but extremely difficult. Anything larger is impossible. 10) Without training, C&C breaks down easily. Even with people who have worked together before, C&C falls apart easily. With a scratch force, C&C will disintegrate immediately. Good C&C will be require constant, frequent training. The team I was on consisted of a core of people who worked together before, including several military veterans and police officers. Attached to that group were several of us who had never worked with them before of vastly different skills and age levels. The core group made up the leadership. Even in these ideal circumstances, C&C broke down frequently, largely due to overall lack of training. The other groups who had no such advantages lost C&C completely. Good C&C and ability to move quickly helps a lot. 11) Even simple chemical weapons such as CS will be a problem. 12) We had some people using FMRS/GMRS radios. The radios frequently failed to work, causing additional problems as there was no plan for runners. In addition, hand and arm signals were not in use. In a real scenario, all commo would be intercepted in addition, giving the opfor full knowledge of plans. I’m leaning towards brown as a good color for clothing. Black stands out. Camo will be widely used by .gov forces, as will green and black. See Part II for further insights. Excellent evaulation. And it is really good for getting the younger set into some kind of training. If broken up into tactical, and then fun time sessions, you can get their interest and their budding maturity involved. My guys are into it, and it does have value.